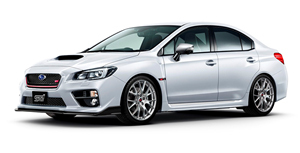 Tokyo, October 4, 2016 – Subaru Tecnica International (STI),*1 the motorsports division of Fuji Heavy Industries, launches a limited-edition model based on the “WRX S4”. The model will be on sale for a limited period starting October 4, 2016 through March 12, 2017. In pursuit of driving performance, the WRX S4 tS inherits some expertise of the S207 which stands at the pinnacle of the STI complete car lineup. The model also adopts advanced safety features such as the EyeSight*2 driver assist technology. While engine torque during acceleration has been enhanced by 10% by employing modified air intake/exhaust parts, added oil cooler improves cooling performance of the Sport Lineartronic. Same as the S207, Handling is enhanced by the addition of original STI components including a flexible tower bar, DampMatic® II front suspension with adjustable damping, and front-rear Active Torque Vectoring, all of which combine to achieve a strong yet flexible ride and sharp cornering. Braking performance has also been enhanced with Brembo opposed-piston 4-pot brakes in front. 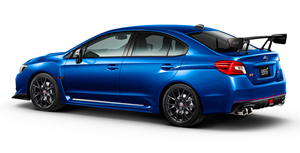 The new model comes with distinctive specifications: On the exterior these include STI-designed BBS 19-inch forged aluminum wheels, cherry red pinstripe on the mesh-type front grille and rear bumper, large front under-spoiler, black roof antenna (shark fin type), while the interior features STI-spec Recaro front bucket seats and an exclusively-made luminescent speedometer. An “NBR Challenge Package” is also available, commemorating Subaru’s victory in the SP3T class*3 in the 2015 & 2016 Nürburgring 24-Hour Race. *2. EyeSight(ver.3) as it is known on the Japanese market. *3. A class for turbocharged vehicles up to 2 liters.